It’s only been a couple of years since a red-hot real estate market had our city riding high. The market turned out to be a bubble, of course, and it eventually burst. Gone is the giddiness that comes when folks convince themselves that real estate or high tech stocks or any other trend or commodity can defy gravity and continue upward forever. Yet giddiness isn’t the only thing that’s been lost. 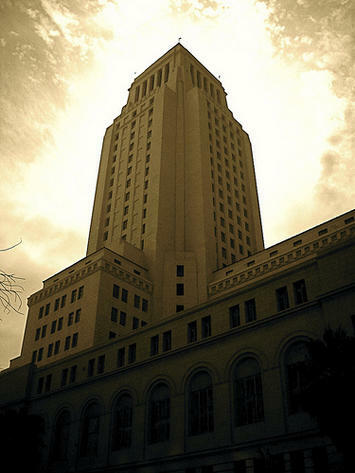 Ideas have disappeared from the political landscape of Los Angeles. That’s particularly unfortunate because there’s plenty of work to be done after bubbles burst—everything from big efforts on the macro-economic level to the everyday challenges of mending lives torn asunder by financial strains. Local government can play a key role in such efforts. That means that politics is part of the picture—and that means that our city’s politicians have a chance to help by coming up with new ideas on how to spur a recovery. Yet our recovery is dragging along in Los Angeles. The federal government’s own struggles and the dire straits faced by state officials surely complicate the job at the local level, but those don’t fully explain the malaise we’re living through right now. It’s more likely that our city suffers from a dearth of ideas because our politicians became addicted to the red-hot real estate market. It’s looking more and more as though that became their one and only idea. They skimmed off the rising tide of real estate, used the money to buy political points, and stopped thinking about any new ideas. It worked for 10 years or so. The values of homes and other properties went up, and so did the city’s revenue. Developers paid fees to build residential and commercial units, buyers paid higher property taxes in the rising market, homeowners borrowed against their houses and spent freely, paying sales taxes along the way. All of the action sent streams of revenue to various levels of government, and much of the money found its way to the city’s coffers. Local politicians used the money to take care of donors with favorable deals, satisfy labor unions by expanding payrolls and paychecks for city employees, and provide basic services to enough voters to maintain the status quo. Now the revenue streams have dwindled, and there’s not enough for our politicians to finance their old scheme. There have been many reactions to our city’s challenges, but not much in the way of ideas. Our politicians have jumped from budget projection to budget projection, cutting here, threatening to cut there. Outside City Hall is a different story, as the populace begins to sense that this is all reaction with no basic idea. Whatever happened last week means nothing this week because the next budget report could prompt any sort of reaction from the politicians. There are no guiding principles or declared values—no ideas—for our city. This became clear to me when I realized that our City Councilmembers and our mayor used to send out all sorts of press releases back in the days of the real estate boom. There were notices that some project had been completed or another had just started. They almost always involved the expenditure of city funds, and went on about the politician who flipped whatever switches made the money flow. Now the money has dried up, and press releases are few and far between. That makes sense—if you accept the premise that spending money is the basis of any and all ideas when it comes to public policy. The truth is that more ideas are needed when there’s no money to spend. Yet I can’t remember the last time I saw a press release about an idea from the mayor or a City Councilmember on how to save money without cutting jobs or programs. I don’t recall any notices of a new idea that will maintain services without adding costs. I haven’t seen any communications that indicate our politicians have come up with any new ideas to meet the challenges our city now faces. It appears that we have an entire generation of politicians who see spending money as the whole idea of government. Well, we’re out of money. We need to know if our politicians have any other ideas. And they shouldn’t worry if they’re all out—voters are getting a few ideas of their own. Jerry Sullivan is the Editor & Publisher of the Los Angeles Garment & Citizen, a weekly community newspaper that covers Downtown Los Angeles and surrounding districts (www.garmentandcitizen.com). Submitted by rrrbert on Tue, 04/23/2013 - 05:44. After Columbus’s return, Ferdinand and Isabella immediately saw the opportunity to colonize the newly discovered lands for Spain. This time Columbus had no trouble assembling a fleet or crew for a return journey.